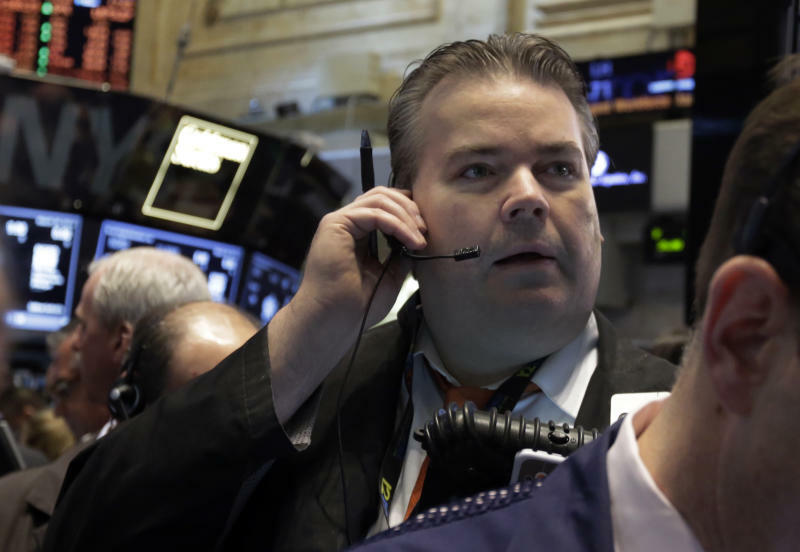 NEW YORK (AP) — Stocks closed higher for a fourth straight day on Wednesday after a report on hiring provided another encouraging sign that the economy is emerging from its winter slump. The Standard & Poor's 500 index closed at a record high for the eighth time this year. The Dow Jones industrial average also rose above its record closing level during trading, but fell back and finished just short of its first all-time high of the year. The stock market has turned higher this week after moving largely sideways for most of the year as reports have suggested that the economy is strengthening after slowing down during an unusually harsh winter. The catalyst on Wednesday was a private survey that showed that U.S. companies increased hiring at a rapid pace last month after a strong manufacturing survey a day earlier. "In January and February we had that weather weakness and it's now showing through that ... the underlying economy is fine," said Jerry Braakman, chief investment officer of First American Trust. "Economic expansion should continue." The Standard & Poor's 500 index rose 5.38 points, or 0.3 percent, to 1,890.90. The Dow Jones industrial average climbed 40.39 points, or 0.24 percent, to 16,573. That's just short of its record close of 16,576.66 set Dec. 31. The Nasdaq composite rose 8.52 points, or 0.2 percent, to 4,276.46. Payroll processer ADP said private employers added 191,000 jobs. ADP also revised February's job creation up to 153,000 from the 139,000 figure reported earlier. The report comes ahead of the government's monthly report on jobs, scheduled to be released on Friday. Economists are forecasting that U.S. employers added 200,000 jobs in March, according to data provider FactSet. That would be the most since November last year. "In general, expectations for this Friday's non-farms payrolls number have clearly risen over the last two weeks," said Gary Flam, a portfolio manager at Bel Air Investment Advisors. There was more encouraging news on manufacturing Wednesday as the Commerce Department reported that orders to U.S. factories rose 1.6 percent in February, the most in five months. On Tuesday, the S&P 500 gained after the Institute for Supply Management said its manufacturing index rose in March. Industrial companies were among the biggest gainers in the S&P 500 index on Wednesday. The sector has risen 2.7 percent over the last week, as signs have emerged that manufacturing is strengthening, makes it the second-best performer of the 10 industry groups that make up the S&P 500. After the jobs report on Friday, investors will turn their focus to corporate earnings, as companies start to report for the first quarter. First quarter earnings are expected to grow by just 0.4 percent for the quarter after rising 7.8 percent in the fourth quarter, according to S&P Capital IQ. Expectations for the earnings in the first three months are low, in part due to the weather, said Jeff Kleintop, Chief Market Strategist for LPL Financial. However, investors will be looking for signs that companies are expecting revenues to increase during the remainder of the year. "The question is, did they start to see a reacceleration toward the end of the quarter, as we're seeing in some of this economic data," Kleintop said. Government bonds fell after the ADP report. The yield on the 10-year Treasury note climbed to 2.80 percent from 2.75 percent on Tuesday and is now at its highest level since January. In commodities trading, the price of oil fell 12 cents, or 0.1 percent, to $99.62 a barrel. Gold rose $10.80, or 0.9 percent, to settle at $1,290.80 an ounce. — Apollo Education slumped $3.10, or 8.8 percent, to $32.02 after the company reported revenue that fell short of investor's expectations. The company said new student enrollment at its University of Phoenix fell drank 16.5 percent. — MannKind soared $2.97, or 74 percent, to $6.99 after FDA advisers voted unanimously to recommend approval of the drug Afrezza, a fast-acting insulin, for patients with the most common form of diabetes. MannKind has no products on the market and lost more than $191 million last year.